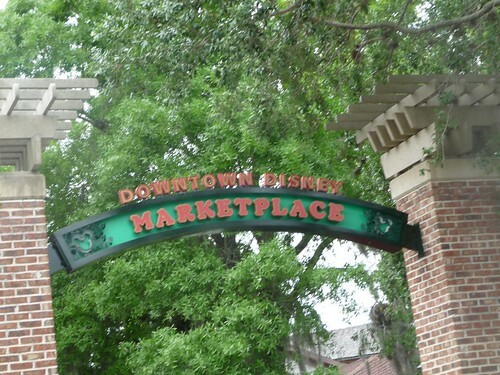 Mali Mish – Day 76: Downtown Disney and on to St. Augustine. After 4 nights at Fort Wilderness, today is finally the day for us to head out. Even though we are sad to leave the happiest place on earth, especially true for Ava, we are looking forward to head out for some more adventures. After all, we have had the last 20 or so days completely planned out. That is the complete opposite of how the rest of our trip has been and we are looking forward to having a little bit of uncertainly in our explorations. 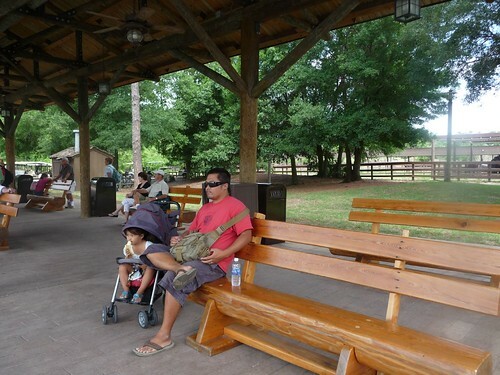 Before we head out of Fort Wilderness just yet, we took advantage of a little perk they offer for departing visitors. Just outside of the gate, they have over-sized parking. We were told that we are welcome to park there for the day and continue to use the Disney World public transportation to go anywhere we’d like. And that’s exactly what we did. We have spent the last 4 days splitting our time between Fort Wilderness and The Magic Kingdom. So today, we are going to do a little hanging out at Downtown Disney. Downtown Disney, just like everything else here, is huge. We stuck to the marketplace because we wanted to take Ava to the Disney store here and have her pick out a little parting gift. But before any of that can happen, we had to eat. 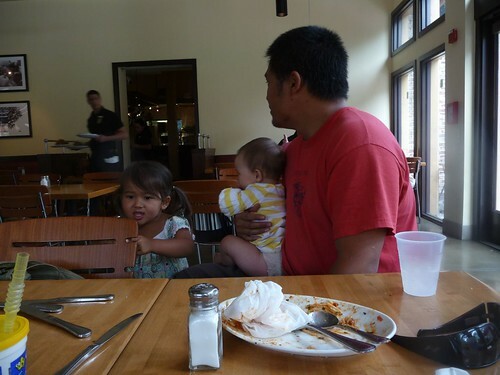 And eat we did at a Wolfgang Puck Express. I ate my half roasted chicken so fast Marlene could not even take a picture before it disappeared. As usual, Disney characters are everywhere at Downtown Disney. Not in a form of cast members in costumes but larger-than-life statues. 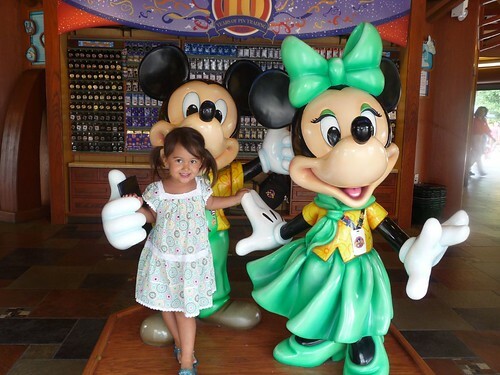 Ava just needed one last picture with her mouse friends before we headed out. 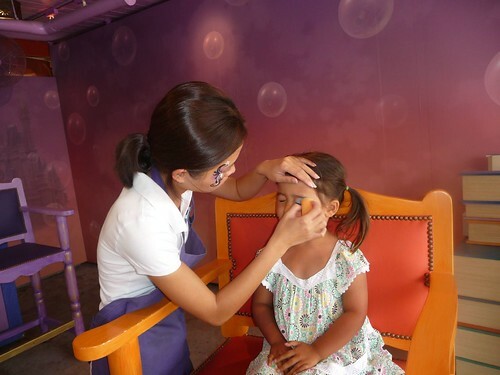 One thing she has really been hoping to do here is getting her face painted. 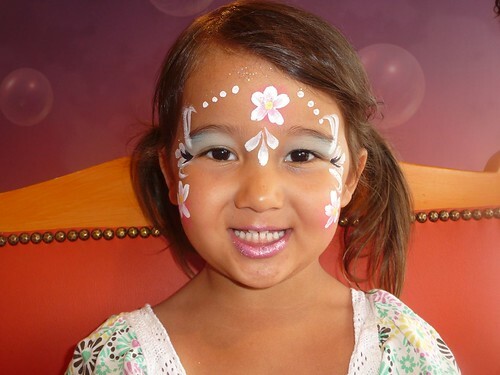 After seeing girl after girl at The Magic Kingdom with painted faces, she was really excited when we saw the face painting booth at the marketplace. She picked this little number out of probably 50+ designs. She was so impressed by the face painter, she said later in the day that when she grows up, she wanted to be an artist just like her. 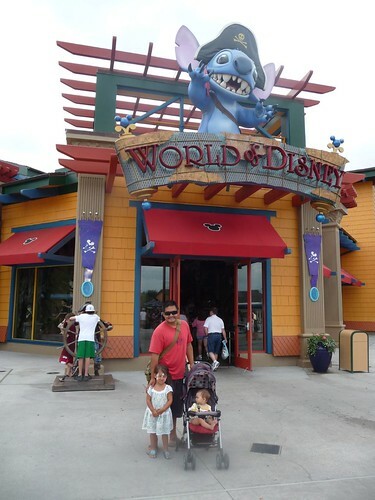 Finally, we got to the World of Disney store at Downtown Disney. This place really is huge. In fact it was so big, we were a little overwhelmed at all the things inside. We asked Ava to pick out one thing that she really wanted and we would get it for her. 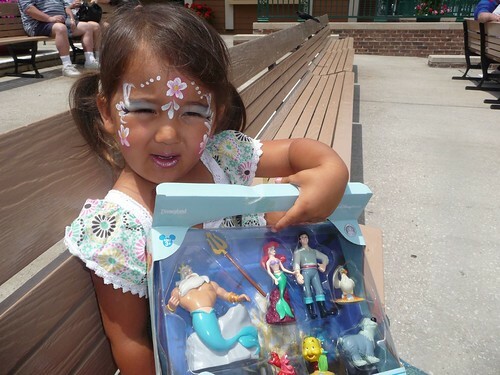 And what she came up with is this Little Mermaid set of figurines. Lucky for us, she didn’t pick the massive Cinderella castle play house. Not only was it expensive, we would have to leave half of our belongings in Orlando to take it with us. The weather has been really warming up here in Florida and we decided to just head out towards our next destination after Downtown Disney. Marlene has a cousin Chris who is in the Navy stationed in Jacksonville and we had been trying to find a good time and place to meet up as we came through here. Before heading up to Jacksonville to see Chris however, we wanted to spend a day in a little town just outside of it called St. Augustine. It is the earliest settlement city in the continental United States dating all the way back to the 1500s. 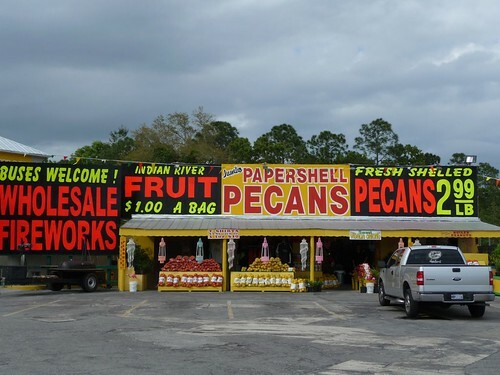 Before we got there however, we were somehow sucked into this tourist trap of a pecan stand next to the freeway exit. Don’t let the cheap prices fool you, we ended up spending a fortune here on nuts and a bag of oranges. 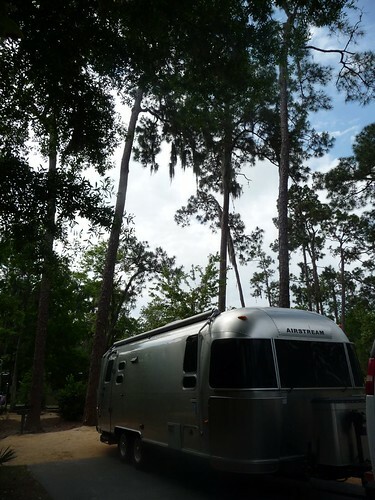 As we headed to St. Augustine, we needed to find a place to hang our hat for the night. 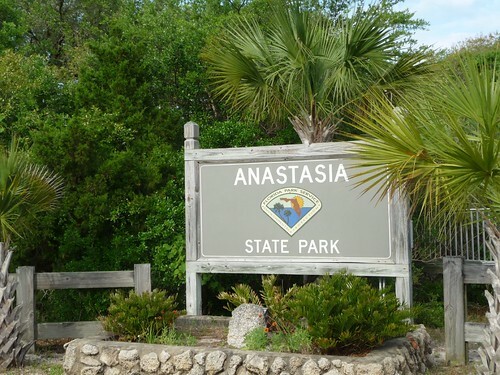 Thanks to mobile Internet, we searched the Web for some of the more recommended places to stay and it led us to a nice state park here called Anastasia State Park. We got here just before the park office closed and they even had an open site for the evening. One small problem at Anastasia however is that our Sprint Aircard as well as our phones have really poor reception here. The ranger at the office said to expect even worst reception inside the park. Since we had been getting the most out of Disney World, I desperately needed to catch up with some work. Without the Internet, that is not going to happen. Knowing that a Walmart was just a few miles away, we left the park and headed over to the only Walmart in the 20 mile radius of St. Augustine, FL. And wouldn’t you know it, it does not allow overnight parking. This is not the first time we have found ourselves in this situation. 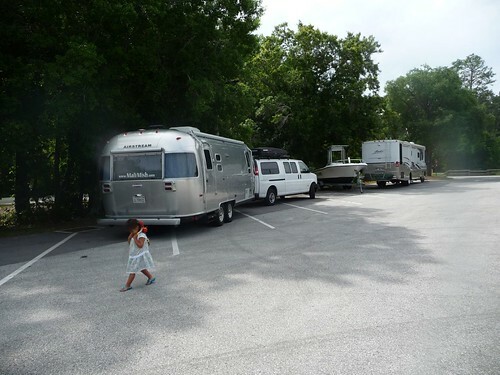 Back in the Florida panhandle, we searched high and low for a Walmart the first night we got into the state and were finally able to find a suitable spot well after the girl’s bed time. This time however, we had a harder choice to make. Do we skip St. Augustine altogether and head to a Jacksonville Walmart, or do we look for other alternatives? After a stop at the grocery store parking lot for a little driving break and research, we decided to backtrack about 30 miles to Palm Coast, FL where another Walmart was located with our favorite east coast burger joint, Steak ‘N Shake right in it’s parking lot. It was meant to be, I thought to myself. Back tracking 30 miles to Palm Coast, FL. We have developed a bit of a Walmart scoping technique since we have been on this trip. First thing we do is to locate all of the ones within our general vicinity using the Google Maps app on my smart phone. If it is close by, we typically would just drive there. If for whatever reason, we didn’t like the place, or in this case, it didn’t like us, we would stop and bust out the laptop to do some more in-depth research. Thanks to Google Map’s satellite view feature, I am able to get a sense of how big the parking lot is and through that, how new the Walmart is. Compare all that with some websites that aggregate user-contributed data about whether or not overnight parking is allowed. All that passed with flying colors with the Walmart in Palm Coast and we were very certain that backtracking there was not going to be a problem. It sounded like a better plan than to skip our visit to St. Augustine. Once we got to the Palm Coast Walmart. We once again were faced with the posted ‘No Overnight Parking’ signs littered across the parking lot. I guess we got what we asked for. We now are on a real wild-goose-chase of an adventure we were looking for after our 20 days of campground reservations. We ate at the Steak ‘N Shake anyways. It was of course delicious as always. We put the girls in the pajamas and headed back on the road searching for the next option. We probably should have taken that last site at Anastasia. Throughout this entire trip, we have stayed at Walmarts whenever we had a long transit day. It was just accessible and we could do some shopping to stock up as most of them now have a grocery section. The lone exception was the very first night after a long drive out of Los Angeles when we finally crossed the border at Ehrenburg, Arizona. We stayed our first night at a Flying J truck stop. For some reason we had sort of forgotten about truck stops as an overnight option. A quick search on my phone we located a Flying J just a few miles outside of St. Augustine. One we probably passed on the way in as well as on the way back out. As we pulled into its parking lot, a dedicated RV section awaited us with a handful of other travelers already sound asleep. We sandwiched ourselves between a couple of 5th wheels and finally were able to shut the diesel engine off for the day. The girls by this point were sound asleep and dreaming their sweet dreams. Actually Mila seemed to be dreaming about being in a Kung-Fu movie. And Ava was likely dreaming about being a gazelle in the plains of Africa. Day 77: St. Augustine and our last night in Florida.